This is a cute top from McCalls M7083. It's a fairly straightforward pattern to sew. I chose the shorter version and omitted the pockets. The pattern calls for woven fabrics but I decided to do something different -- I mixed a knit with a woven. The lightweight knit is used for the main body of the top. The sleeves and front side panels are sewn from this very interesting sheer silk windowpane fabric underlined with some lawn weight cotton. I've had a small amount of the silk in my stash for a while and wanted to use it up. It has a bluish tinge, which goes well with the baby blue knit. Even though I made the shorter length, I still had to shorten it some more. I shortened the back more than the front and reduced the drop angle of the front sloping hem sides. 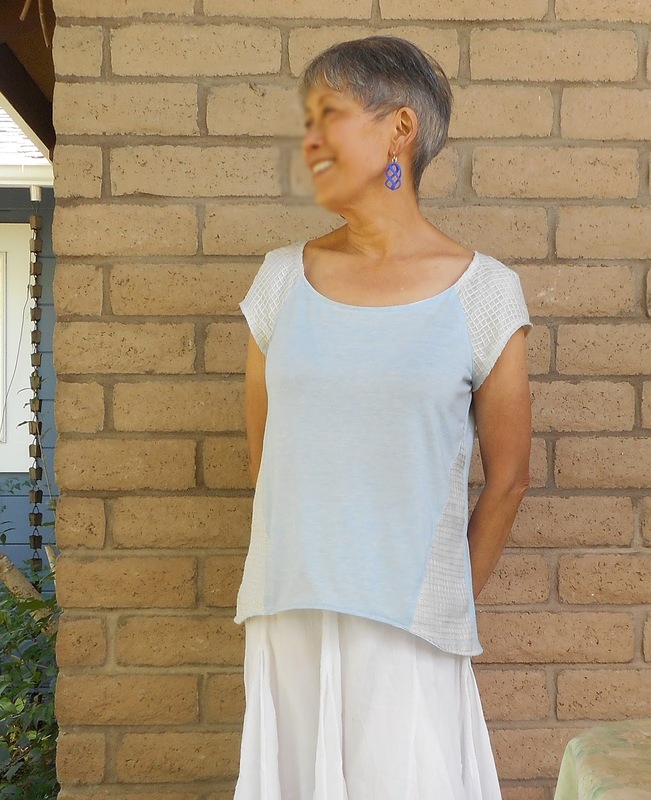 I did cut everything on the large side, since my knit is really thin and I wanted it a very drapey top. 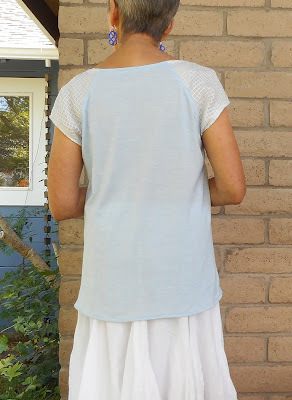 I used bias tape to finish the neckline, hem, and sleeve openings. My neckline is wider, but not by design. I had a little snipping accident when trimming a seam that left a hole so I had to cut away some of the neckline. 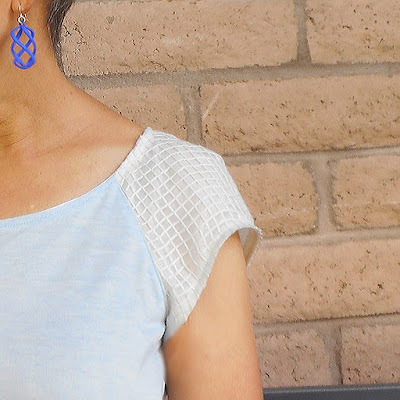 I decided I like this wider neckline for a summer look. The mixture of knit and woven fabrics came out great. I'm going to try this again and make an all-white top since I'm a big fan of white tops for summer. NICE! I like the close-up, showing the lattice work on your earring, next to the "filet" sleeve. Simpatico!